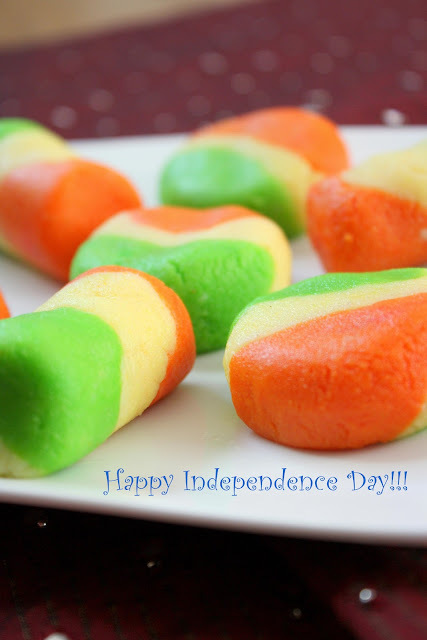 Cook like Priya: Tri-color Pedas - A sweet Independence Day!!! Its the tri-color fever that is catching up in Blogger and I was wanting to do something with the tri-color theme. And today on random the idea of Pedas struck me and I was totally game for it. 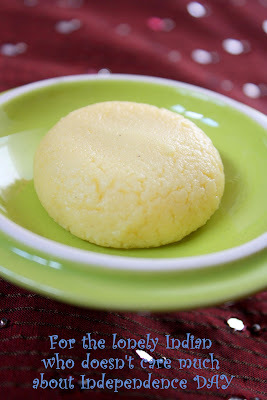 I am sure every INDIAN would have tried this milk sweet and is truly an Indian recipe and is for sure a perfect tri-color recipe to post on Independence Day. No matter where life takes us or what we do, we sure have an Indian side to us that is never going to change... So be proud to be Indian !!! and keep your head high. 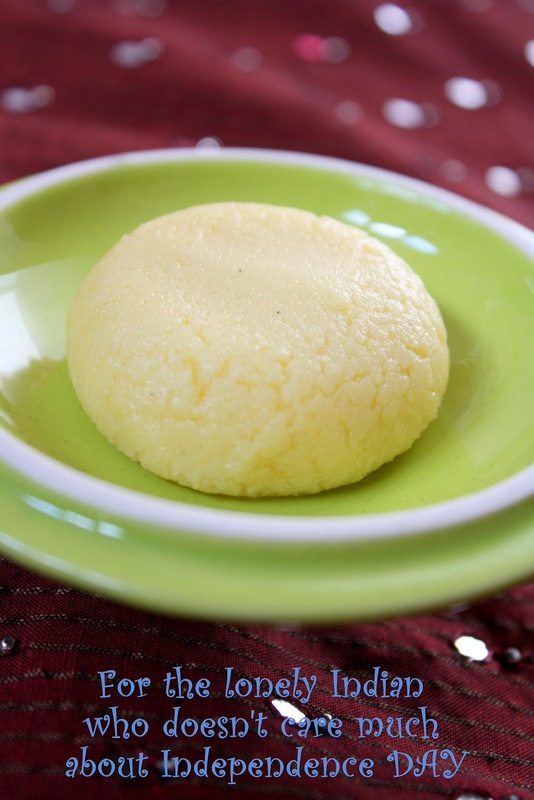 In a microwave safe dish, melt the butter. Add in the rest of the ingredients and mix well. Cook in the microwave for 3 minutes, stirring very well after every minute. After the 3 minutes, mix well again and leave aside for the mixture to cool down enough to handle. Split the mixture into 2 other containers and add the colors (just few drops) and mix well with a spoon. Once the mixture has cooled down, grease your hands and make balls.Gently press the balls and flatten them to shape…round and flat. Decorate them with colored sugar, almonds, cashews, pistachios or raisins. Let the pedas set and cool down. Wow, that looks so pretty! Priya, Tri color pedas looks delicious. Happy independence day. can you put a link back to Hearth and soul blog hop. Happy independence Day priya.... love the colors...looks so yummy and beautiful.. Happy Independence Day dear. Peda is carring a patriotic message. Happy Independence Day Wishes to you n family !!!!!! wow.. pedas look so delicious and perfect!! Happy Independence day Priya! Nice pedas. 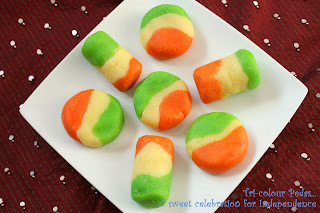 Thanks for sharing the tri color peda with Hearth and Soul blog hop. I am highlighting the recipe on this week Hearth and soul blog hop. Priya I need you link it on the Hearth and soul blog hop. Then only I can highlight your recipe. Thanks so much for sharing this tri coloured pedas,am just loving the whole idea.I am your newest follower.Would love it if you would drop by at mine.